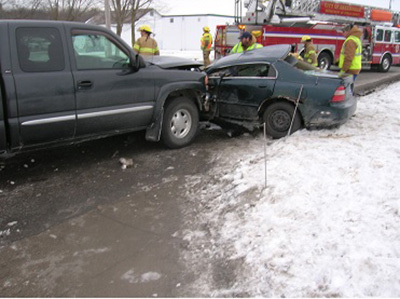 Tag Archive | "Greenville Department of Public safety"
Montcalm County Sheriff’s Department received a report of a two-car crash on Greenville Road south of Wise Road at approximately 3:00 p.m. on Sunday, January 7, 2017. The investigation revealed that William Mason, age 46 from Belding, was leaving the parking lot of a local business in his blue 1994 Honda Accord and pulled into the path of a northbound vehicle driven by Lyle Joslyn, age 48 from Ionia. Mason’s vehicle was struck in the driver’s door by Joslyn’s black 2003 GMC pickup. Mason had to be extricated using the Jaws of Life due to the damaged sustained to the vehicle. Mason was transported to Spectrum in Grand Rapids for serious injuries. Mason’s passenger, John Dulea age 54, from Greenville, was not injured. Joslyn was not injured in the crash. Police said seat belts were used and airbags deployed during the crash. There are no known factors contributing to the crash and it is not known why Mason pulled into the path of Joslyn. Portions of Greenville Road had to be closed for approximately one-half hour during the extrication and clean up. The crash remains under investigation. Montcalm County Emergency Medical Services and the Greenville Department of Public Safety fire units assisted at the scene. The Greenville Department of Public safety announced this week that a house fire that occurred at 313 E. Cass Street in Greenville on January 13 is being treated as an arson. PSO Jamie Sorsen, lead investigator in the case, determined that the fire was intentionally set on the second floor. The Greenville Department of Public Safety responded to the house fire on E. Cass Street, at about 5:55 a.m., January 13. Officers Casey Huber and Erik Hoig, and firefighter Tom Miller rescued an occupant from the second floor of the residence assisted by Officer Cole. He was later identified as Dennis R. Vanderzand, 65. An 83-year-old woman was also assisted from the residence. Initial dispatch information available to investigators indicated Vanderzand claimed the second person in the residence started his clothes on fire in his bedroom. 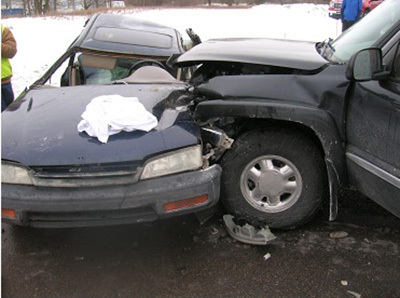 Both individuals were transported to West Michigan hospitals for treatment and evaluation. Sgt. Brian Blomstrom initially investigated the scene and interviewed individuals at the scene of the fire; a search warrant was then executed on the residence in order to determine the origin and cause of the fire. Both Sgt. Blomstrom and PSO Sorsen investigated the fire within the structure. The result of the entire investigation as a whole led PSO Sorsen to rule the fire was intentionally set in the upstairs bedroom of the house. Once the entire report is completed and finalized, it will be sent to the Montcalm County Prosecutor’s Office for review regarding arson-related charges.